Stag beetles, known as kuwagata mushi in Japanese, are very popular as pets in Japan, much like rhinoceros beetles (kabuto mushi). Caring for stag beetles is much the same as caring for rhinoceros beetles, but, there are a few differences in how to care for stag beetles. Please enjoy! Breeding case (Japanese: shiiku case) – just a normal animal aquarium, like what’s used for hermit crabs; usually plastic and cube-shaped. Be sure it is a type that will keep the air inside reasonably humid. Bug bedding (konchuu matto) – if not planning to breed beetles, many types are okay, possibly even dirt from outside. For ease, though, store-bought beetle-specific bedding is recommended. Food (esa) – 100 yen shops and home & garden stores sell special beetle jelly (konchuu zerii), in appetizing flavors such as black sugar, “protein,” and fruit (yum!). Apparently, bananas, peaches, and apples are also good for beetles. 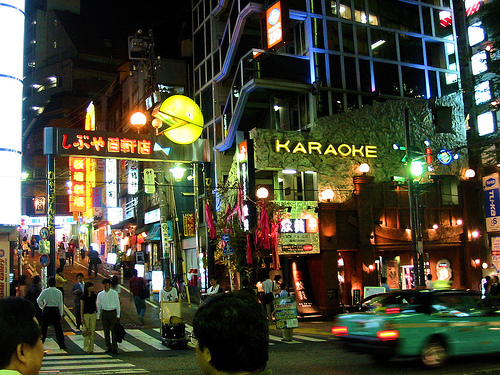 Even though it’s traditional (at least in Japan), avoid watermelons and other water-heavy fruits. Decaying branches, food dishes (kuchiki; esasara) – also sold at stores, although branches from outside are okay too; the branches give the beetles places to hide and the food dishes keep the beetle jelly from spilling onto the bedding. Beetle humidifier (kirifuki) – beetles are very susceptible to drying out, so this spray (or, alternatively a sort of “water bottle”) helps keep their bedding moist. Also, keeping leaves (which can be store bought) in the case helps keep the soil moist. 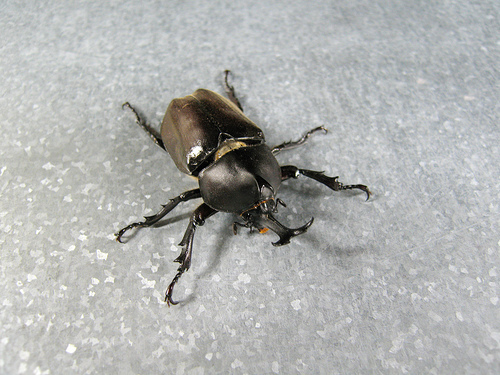 In Japan, stag beetles, as well as several other similar beetles, can normally be bought at home and garden centers, such as Cainz. Typically, it’s much easier to find them in stores during the summer, when they are in season. The typical price is from 300 yen to 2000 yen. I’ve been told kids really enjoy catching wild beetles, but I’ve also heard it may be hard to find them; the wild beetle population has been dwindling because of loss of habitat. Prepare a case before bringing your stag beetle home, or at least prepare it quickly after bringing your new friend home. Stag beetles will get stressed if kept in a small case. As a base, put dirt or store-bought bug bedding in the case for the beetle. If the purpose isn’t breeding, 5 centimeters (about 2 inches) is fine. On top of the insect bedding, place dried leaves, logs, and a food dish, all of which can be bought. Stag beetles will often fall over on their back, and things like sticks and leaves give the beetles something as a foothold to turn back over. Stag beetles easily become dehydrated. You can use a store-bought spray beetle-specific spray (mentioned above) to keep the bug bedding moist. Be careful not to make the soil too wet — that would be inviting mold! Stag beetles are sensitive to extreme temperature. They prefer 20 to 25 degrees Celsius (68 degrees to 77 degrees Fahrenheit). Don’t place them in direct sunlight — a shaded area is best, if outside. If you are keeping them indoors, a cool place such as under the shoe box (a common feature in Japanese houses) is recommended. Also, even though some beetles hibernate in the winter, do make sure not to let the temperature get too low either. Some websites advise using a thermometer for peace of mind. Feed your beetle at least once a day. Then put in the branches and the food. To make sure that the jelly doesn’t make the bedding dirty, you can place it in a food plate. Be sure to change the food everyday, preferably in the evening, to make sure this nocturnal beetle has fresh food as he is waking up. Beetles also like fruits, such as bananas and apples. But avoid water-heavy fruits, such as watermelon, as it will hurt the beetle’s stomach. Also, try to be careful that the fruits don’t have pesticides on them, since stag beetles are, well, bugs. Water for drinking is unnecessary, as the jelly and fruits provide enough, but be sure to keep his/her soil moist — which leads to the next point. Many stag beetles, both male and female, will fight and possibly kill each other if placed in the same case. Although in nature stag beetles often fight, if you keep one beetle per case, they will live longer, healthier lives. Unfortunately, when stag beetles get sick, there isn’t much humans can do to help them. However, you can help prevent sickness by eliminating or at least reducing the beetle’s natural enemies, dani (mites/ticks) and nematodes. Beetles often have dani around their leg and body joints. You can use plain water and a toothbrush and a toothpick to pick these little white mites off of the beetle’s joints. Once you’ve done this, be sure to change the bedding, to prevent re-infestation. You can also buy dani-prevention sheets and special charcoal (kasseitan) to mix in with the dirt to prevent dani. Last step: enjoy your new friend! Apparently, Japan-specific stag beetles are in danger of extinction, because of interbreeding with imported stag beetles and loss of habitat. So, if you buy a beetle, please don’t release it in the wild! Only the males have the long, curved mandibles. It may depend on the type, but stag beetles have been known to live up to 8 years! However, the average is 3 to 5 years. Unlike rhinoceros beetles, stag beetles have a longer lifespan and thus hibernate during winter. Still, be sure to keep the temperature from going below freezing (which shouldn’t be a problem inside) and, since winter is often dry, keep careful watch on the moistness of the soil. Your beetle friend will burrow in the soil to sleep through the winter. Some beetle keepers breed beetles in the winter, disrupting the beetle’s hibernation. This is very likely to shorten the beetle’s lifespan, so it is probably better to let your beetle sleep. Stag beetles CAN bite with their mandibles. Be careful! Also, they are able to fly. These beetles don’t make noise, but the sounds of their scurrying can be a bit loud sometimes. For this reason, some websites advise that if you keep your beetle inside, that you don’t keep it in the bedroom. The Japanese word “kuwagata mushi” means literally “hoe-shaped helmet crest bug.” This refers to the beetle’s long, curved mandibles looking like one of the traditional Japanese samurai helmets. In English, these beetles are called “stag beetles” because their long mandibles resemble a deer’s horns. I am not a professional beetle caretaker or any kind of expert on stag beetles; just a fan. All of this information was compiled, translated, and arranged from the below sources. If you’d like to know how to care for a rhinoceros beetle (kabuto mushi), check out this link. How low is too low of a temperature? It’s kind of expensive to keep my heater on during the winter here, so I’d like to reduce that cost, if possible, but the health of my beetle is more important. Pretty cool article!, very attractive and informative. I personally keep three species of mushi’s one of which is a Kuwagata (Dorcus Taurus), pretty cute little guys, which i just got on 9th of february which is yesterday. Also two species of kabuto mushi X. Gideon and Chalcosoma Cucasus (a living tank). i got decent knowledge on keeping beetles, and handling ticks. But i’ve never took care of a stag beetle, i didnt know that these guys live WAY longer than the kabuto mushi till i clicked this part of your article (i always read your kabuto mushi guide), which makes me happy to welcome a new pinchy friend for the coming years! and for my experience, i’ve never had a flying problem with any of my MALE beetles, its usually/almost the females. Pinchy friend — I love it! Yes, I was very surprised that kuwagatas live so much longer than kabutos in the wild. A friend told me that it is because kuwagatas are slim enough to hide behind bark and in other small, warm spaces during winter while kabutos are too big. Fortunately, kabutos can live a longer time indoors from what I have read, so more time with a slightly less pinchy friend. Do you know of a website where I can purchase the larvae/grub of a Stag Beetle / Kuwagata Mushi and all of the necessary accessories like habitat enclosure and jelly etc..?? I would need this shipped to California, USA. Unfortunately, I am not sure of any mail order beetle shops. You may wish to ask at a pet store nearby, especially ones that sell insects or exotic animals. I’m interested in attempting to maintain a couple of kuwagatas and try to get them to lay eggs, that way I can continuously breed them and keep them going. My concern is that you mentioned they live up to 8 years, but commonly 3-5, but I’m guessing that depends on the species. Which species lives that long? Because that would be the species I’d be interested in. I currently keep hermit crabs, so I’m used to the idea of a roomy tank with very specific temperatures, humidity levels and mix of substrates. Good question! The lifespan seems to depend a lot on the species. This website seems to indicate that the longest living kuwagata is the ookuwagata (giant stag beetle). The website states that they are in their larval form for up to 3 years and then that it isn’t rare for them to live in their adult form for 5 years before they pass. Btw, I don’t have a translation for breeding or raising stag beetle larva, but if you can get Google Translate to help you this website and this website may help. Quick question! I’ve been thinking about a beetle recently, and I was wondering, do you need to change the dirt during the winter? Because that would disturb their sleep, right? I live in Hokkaido, so my winter will be pretty intense…I’m a little worried about heating. Good question. According to several beetle care websites, the answer is “no,” you do not have to change the dirt. However, you should change the dirt directly before winter starts and be sure to put a log/some wood in the case. Also, a little mold is apparently fine, but if it gets out of hand, you can use a tissue to wipe the mold off. You can also avoid mold by not spraying water on the log/wood in the case. In addition, many websites suggest that you place cellophane wrap with small holes punched in it on top of the case (between the lid and the case itself) to keep in moisture and heat and keep out bugs. If the dirt becomes dry, you can gently spray water on the dry parts. For food, you may put a jelly cup in the case. You do not need to change the jelly unless it becomes empty. The case should be placed in a cool quiet place that does not change temperature rapidly (under genkan shoe box for example) that stays above freezing temperatures. This morning our high school Japanese neighbor gave me a young stag beetle or kuwagata mushi in a transparent container with a hole on top and few twigs and little branches in it. I couldn’t ask him what to feed because I don’t know how to ask him in Nihonggo, all I know is, its was beetle but I just found out from google that its was a stag beetle kind and I saw some clip on youtube of a rhino beetle fed with an orange, we only have a grapes, apples and oranges in our fridge so I just decided to give our little friend a little bit of orange, I hope she’s gonna eat it, do you think it can be a substitute for jelly just for the meantime? coz she has not touched the food yet, she’s just hiding under the leaves. I’m going to try if they have a beetle jelly in the closest 100 yen store tomorrow. I’m not sure about oranges, but lots of sites recommend fruits with lower water levels, such as apples and bananas. Nowadays, it’s recommended to stay away from water-heavy fruit, like watermelon, to avoid upset stomach and a messy cage. I noticed my kabuto mushi wasn’t eating a lot during the day, but in the evening and at night, he munched happily away at the banana I gave him. Beetles seem to be more active at night, so I hope this happens with your stag beetle! I’ve recently become interested in taking care of a kabuto or a kuwagata, but I have a few concerns. After reading about this article and learning about mites, I’m concerned about owning a beetle. Are they dangerous mites? Also, the article said ticks? Like the kind that burrow into your skin and carry Lyme disease? How much of a concern are they? Are dani repellent methods effective? I was thinking of raising one from a grub. If they’re raised in captivity in this way, does this reduce the chance that they’ll get mites or is it about the same either way? Also, I was told (but may not be true, if not, please tell me) that the kabuto should be picked up by the horn because the rest of the body is prickly and will hurt to touch. If that’s the case, how do you pick up a kuwagata? Any and all answers are appreciated. Thank you! The mites (tiny white ones barely visible to the eye) I mentioned aren’t particularly dangerous from what I know. They are part of the tick family, but they aren’t the kind that burrow into your skin. They do bite, though, which is kind of itchy and annoying. They’re similar (same? I’m not sure) to dani that proliferate if you don’t dry out your futon. As long as you keep the bug case clean and keep humidity down, though, then they won’t get out of control. I’m afraid I don’t know about raising kabuto mushi from grub and if it will keep dani down. Dani repellent methods are likely to be dangerous to the kabuto mushi, so I personally wouldn’t recommend it. I’ve heard of some people picking the mites off the beetle one by one with tweezers, though, which is one time-consuming way to go about it. As far as being a concern, I’d never actually heard of them until I owned a beetle myself and experienced them first hand. In full disclosure, I wasn’t very good about keeping my apartment low on humidity. When I mentioned it to my Japanese friends, they were casually like “Oh yea, the mites, haha,” so I don’t think the mites are very much a concern; more of a minor annoyance. 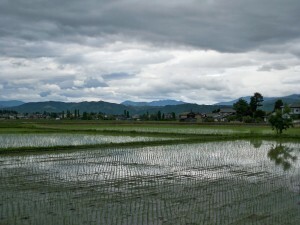 You can use bug-repellent dirt called 防虫マット or 防ダニマット (boumushi matto/boudani matto) to keep harmful bugs away. Some Japanese sites even say that you can use normal mite-repellent methods to keep a kabutomushi dani-free. Again, I don’t know how safe those methods are for kabutomushi or humans. Some sites also recommend using a toothbrush to brush mites off the kabutomushi’s body. Thank you for this article! We just found our kuwagata crawling around on hot concrete and very sad to read they are almost extinct in the wild. :c We will be keeping our little guy safe and sound for as long as we can! It is tragic that so much of insects’ natural habitat is being developed — hot concrete isn’t a very nice place to kuwagata, I think. Good luck with the little guy! 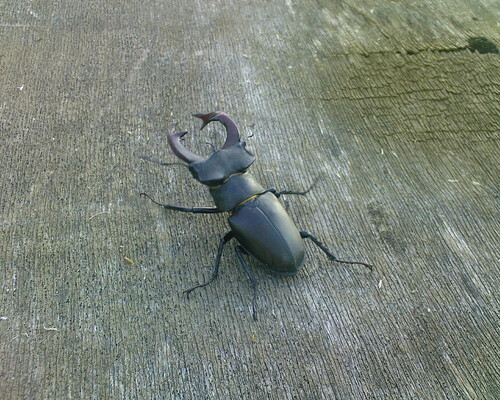 Hi have just found stag beetle male in garden on its back with half a front leg missing. I put him up the right way and he keeps turning himself on his back and looks in pain?! Should I keep trying correct or is he dying? I’m so sorry to hear about the beetle you found. Unfortunately, since I don’t have the background in insects, I am unable to answer your question. I did find some links that may be of interest to you and may help you make a decision. Glad someone posted about their care 🙂 Didn’t know they had such long lifespans. Caught my little guy in late August along with two Kabutomushi and it has outlived them both. I had a lot of fun putting this together. Insects are awesome! It definitely depends on the type of Kuwagata as to how long they live, but I too was super surprised when I read about their possible lifespan. I came across this unofficial explanation on the Japanese Yahoo Answers site as to why stag beetles live so much longer than rhinoceros beetles. Apparently it has to do with egg-laying differences in Kabutomushi and Kuwagatamushi. Kabutomushi can lay more eggs and can lay them in more places than Kuwagatamushi. Kuwagatamushi “make up” for this by having longer lifespans. Interesting!